We know you still have a lot of questions about Uppywear and we still have many things to tell you in the week leading up to our official launch on June 29th. I think, first, we need to talk about what we’ve created and give you a little tour of our new wraps. It is true that we managed to find a way to produce the fabric we love so much in a much bigger way but there are some significant differences between Uppywear and our Uppymama custom and handwoven wraps. First, the patterns that we are able to create with Uppywear just don’t have all the variation that our artisan weavers can create in the handwoven fabric. Our artisans have the option of making warps and threading her looms thread by thread to create the “picture” she wants. We simply can’t order that kind of artistry from the mill. So for those of you who love the unique designs of our handwoven wraps we will still be creating those just as we have before. 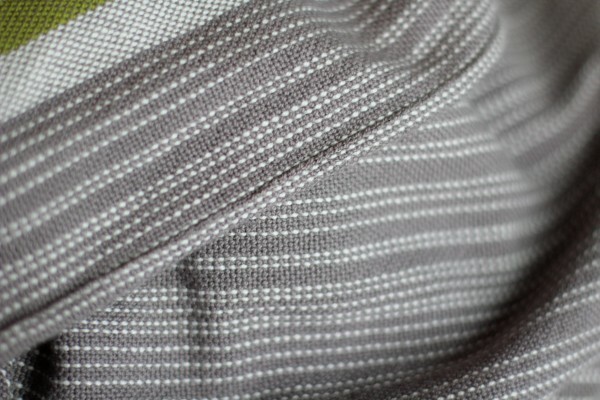 Second, it is not possible to have details woven into the weft of our Uppywear wraps. 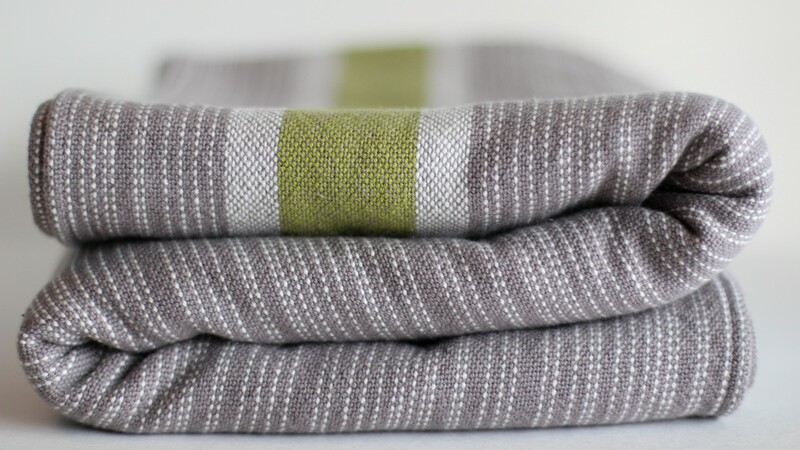 The fabric comes to us from the mill and we hand finish the fabric to create Uppywear wraps. Let’s take a small tour! Uppywear wraps are not woven on a continuous shuttle loom so we do not have a selvage (unhemmed edge) like we have on our hand woven wraps. Our seamstresses create your rails for you by turning a “barely there hem”. This process took a little practice and fine tuning and we are just tickled with how much we love these sturdy yet discreet rails. The middle marker! It makes wrapping so much easier. We just can’t ask a technician operating a huge mechanized loom to measure, stop production at the exact center of the wrap, and add faux grad pinstriping. (For some reason they don’t respond well when we try to make these kind of demands!) So we made you an adorable little tag for the middle of your Uppywear. A little different look in the logo, but our labels are still 100% cotton, prewashed and hand sewn as we still insist on avoiding synthetic materials that do not match up with our values or even non-local production! 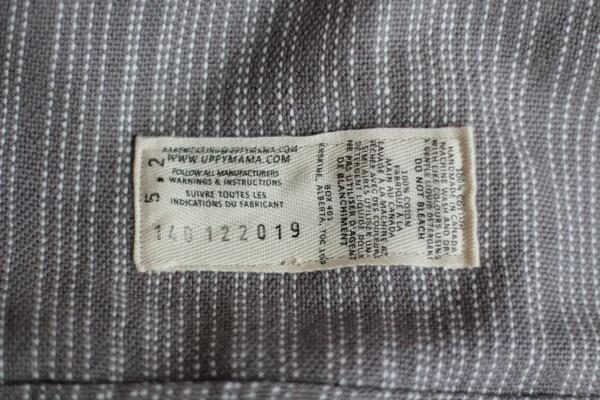 The care label on your Uppywear is still numbered by hand and you will be able to register your wrap on the website with each wrap’s individual number. Now this is what we are really excited about!! This is not a piece of fabric. This is a baby carrier. 1. 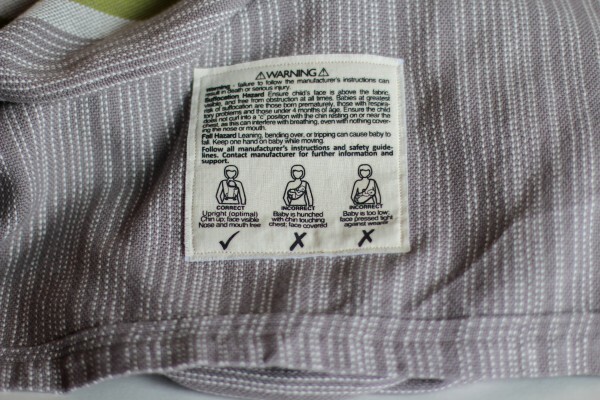 The labels must be prewashed and shrunk so they don’t shrink post production and pucker the fabric of your wrap. 2. The labels must be made of a natural fiber and be soft enough to tie into your knot without bothering you. We simply could not find a company who would make these labels for us so, just like our bags, we had to make them ourselves. We actually pre-wash the fabric, transfer the text and images to the fabric and sew them on. We hope you find them soft, discrete and organic. We want the information to be there, but not be in the way. 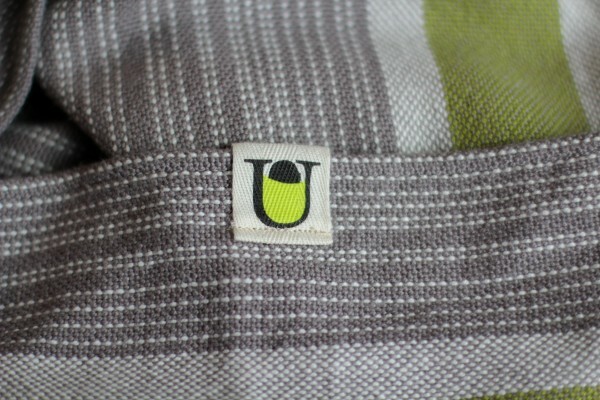 Hopefully this mini-tour of the new Uppywear wrap gives you a better idea of what they’ll look like. We will be clarifying more details in the upcoming week such as cost and how you’ll be able to purchase one. (That would be very, very excited.) Thanks again so much for supporting us in our new venture and all of the great positive feedback we’ve heard from you. It lets us know we’re on the right track and all of us here at Uppymama are thrilled to read your feedback, when we’re taking a break from all this work anyway). Stay tuned as we keep filling in the blanks and have a great day!